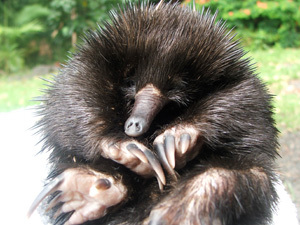 Echidnas travel long distances looking for food, and may travel through your back yard. 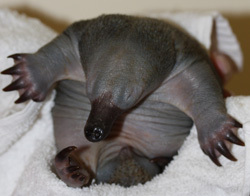 Many calls received by Wires is regarding Echidnas that have" dug" themselves in, and they do not seem to want to move on. 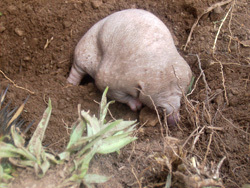 The animal is defending itself the only way it can, by digging into the ground and this happens when it feels insecure and in danger. It may also roll itself into a ball if not able to dig in. 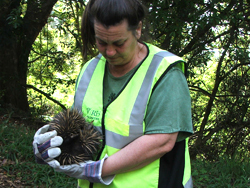 The best thing to do in this situation is simply to leave the area for a period of time, if you have a dog, keep it well away from the animal, and you will find that the Echidna will move away as soon as it is sure it is out of danger, and feel secure. 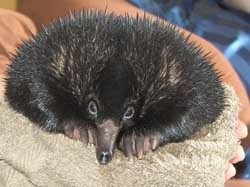 Echidnas have a great memory, and it is unlikely that it will return, once realising that the area is not safe. 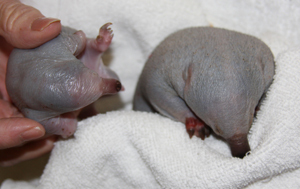 Never relocate an Echidna, it is impossible to tell if it is a male or a female, and as they leave their young in the nest whilst foraging for food, it is important they are able to return. So best leave it alone, let it go on its way when ready. In the middle of winter we are huddled around our heaters, snuggling together against the chill, while outside other critters are rustling through the undergrowth, also seeking someone to snuggle up to, but for different reasons. 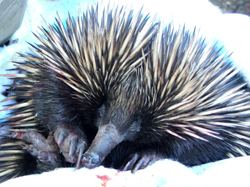 July and August is breeding time for Echidnas, females will be carrying either an egg or a very small echidna in her pouch, so please check if you should see an Echidna on the road hit by a car, specially in the cooler months. 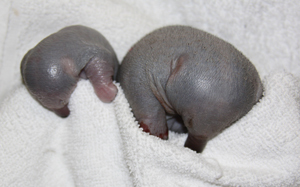 The soft-shelled egg is laid sometime between 10 and 36 days after mating. 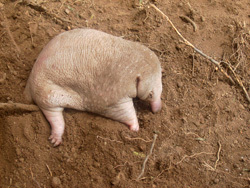 The female lays her egg by lying on her back, rolling it down her stomach and enveloping straight into her “pouch”. 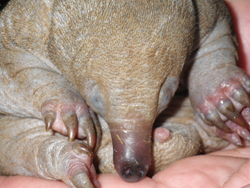 Echidnas do not actually have a permanent pouch; instead they have contracting muscles in their abdomens, which forms a pouch-like fold. 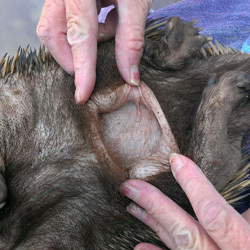 As both male and female echidnas can form a pouch in this way, it makes the sexes indistinguishable. 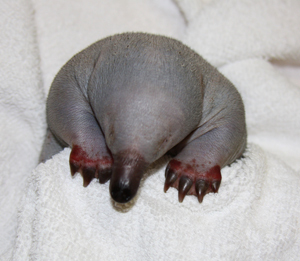 After 10 days the young echidna, which is called a Puggle, taps on the inside of the egg with what is called an egg tooth to break the soft shell, this is the only tooth the echidna has, and it drops off 1-2 days after hatching. 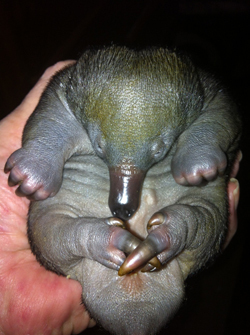 The puggle stays in the pouch for a further 2 months until it starts to develop its spines, at which time mum will dig a nursery burrow in which she will leave the puggle. 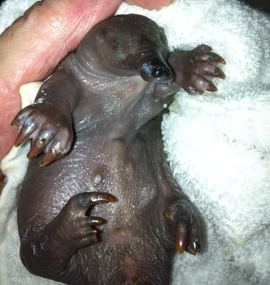 She will return every 2-10 days to feed the young through a series of mammary pores on her stomach. 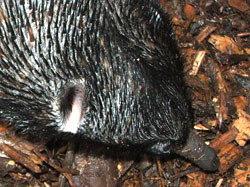 Milk is secreted through these pores, and as with Kangaroos and Possums the milk changes according to the growth stage of the young. How clever is that? 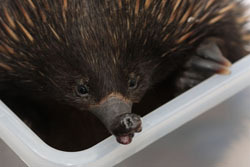 The young Echidna is as far as we know independent at 10 months old. 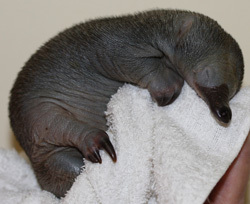 It is unfortunate but the reality is that we do not know a whole lot about the Echidna, it is thought from previous studies that they do not breed till at least 5 years old, and we do not know the average life span of Echidnas, they have survived for over 50 years in captivity. What we do know is that their brain capacity is large, thus intelligent and they have incredible memory capabilities. 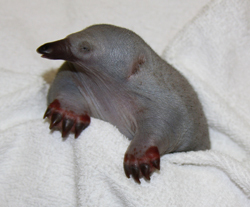 Body temperature is lower than most mammals; they share this low body temperature with the Platypus being 33 degrees as they are the only other species of Monotremes. 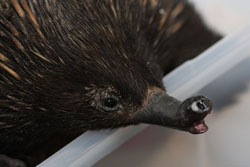 They are excellent swimmers having spines that are hollow thus helping with flotation, and in summer will cool themselves by swimming or going underground in hollows or burrows. 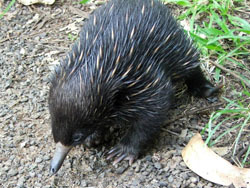 The spines are actually tough hollow hair follicles, the echidna also has fur between the spines, and in Tasmania the fur can be so long that it covers the spines. 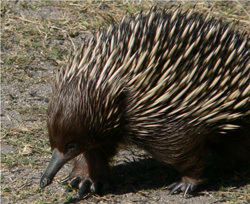 If you see a train of Echidnas, with as many as 2 - 10 walking in a line, the female will be the largest at the front, with the males following along behind, according to size. 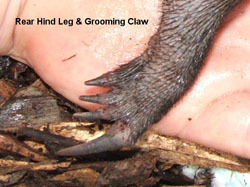 The female may lead the males around like this for up to 6 weeks and males may loose up to a quarter of their body size. 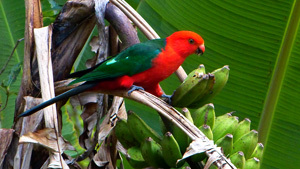 The males are, of course, hoping to mate with the female. 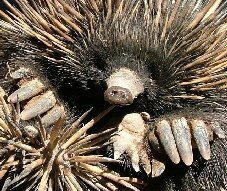 Echidnas do not only eat ants and termites, they also eat small invertebrates, worms and beetles. 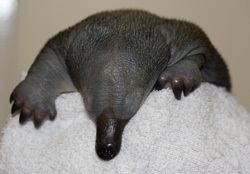 Their tongues are up to 17 cm long and covered in sticky saliva allowing the ants or beetles to stick to it, the tongue is then drawn back into the mouth, where the food is masticated between a horned pad at the back of the tongue and the palate. 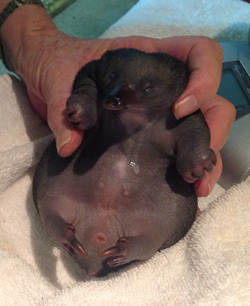 Adult weight varies from 2-7 kg. 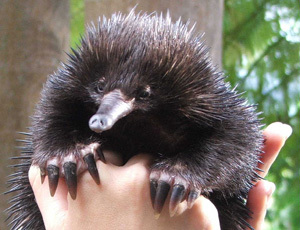 Echidnas did not have many predators before white man arrived in Australia, but since our arrival predators now include dogs, and of course many succumb to our motor vehicles. It is a fairly slow moving animal, so when crossing the road it cannot readily get out of the way. 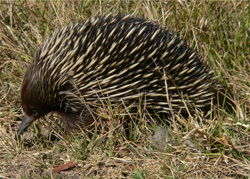 Many of us have had encounters with these animals in the garden, where they may dig them selves in to the ground, if this happens it is due to the animal being frightened, leave it alone, remove the threat (usually the family dog) and the echidna will go on its way once it feels secure. 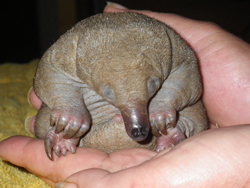 We can not relocate an echidna, they are solitary animals and have a territory, and if removed from this territory they will make every effort to return, crossing unfamiliar territory, also as we do not know if it is a male or female it could have a puggle waiting in a hollow for the next feed. 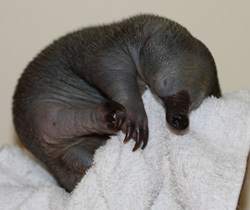 This Echidna was found by the Police, on her back next to the Pacific Hwy near Teven. Her snout was badly broken in several places. 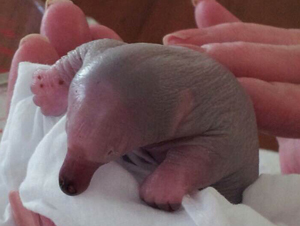 This animal would be in extreme pain, in need of pain relief and veterinary intervention as soon as possible. The only way to ascertain how bad the injury is, is to have the animal x-rayed. 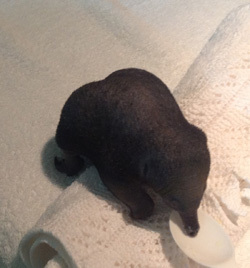 This particular animal was taken to Currumbin Wildlife Hospital where she was X-rayed and consequently euthanased due to the severity of the broken snout. 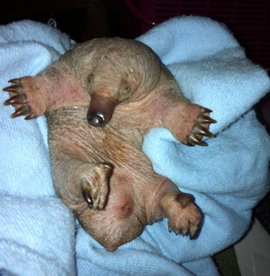 This Echidna was also a lactating female and had left a puggle behind. 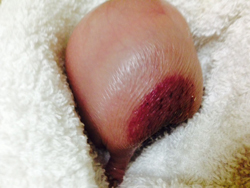 Her abdomen showed signs of use by licking and the hairs were all finely groomed. The mammary patch was indeed in use. With no chance of finding the puggle we only hoped it was at dispersing stage ( this is the time they disperse-although we have found this varies from area to area) and could survive on its own. 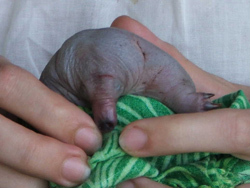 The police were notified and were keen to keep an eye out for any small echidna found wandering in the vicinity of where the Mum was found. 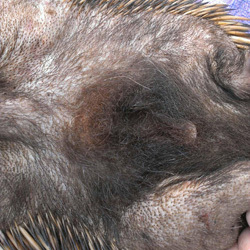 A sad story, we were able to end the suffering of this animal that could have survived for weeks, in severe pain, slowly starving to death as it was not able to eat with the broken snout. 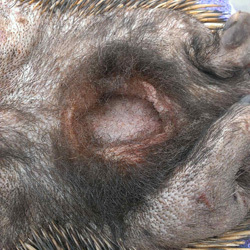 Echidnas that have been injured by cars, dog attacks etc etc MUST be taken to a veterinary clinic and X-rayed, it is impossible to examine these animals properly without X-ray as you can not feel broken bones as in other animals due to the spines. 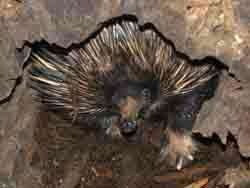 Echidnas do however have a skeleton just like any other animal, and bones break just as easy in this species as in any other, difference is, we can not feel or see it without X-ray. They may look just fine, move normally, as they will not show their injury. 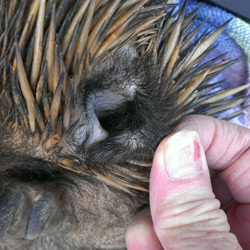 An injured animal knows it is in big trouble, and as such will hide their pain, trying to fool predators. 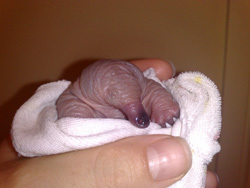 Image of Puggle by Llyris Wood.